167:24:45 Charlie turned to get this "locator" to House Rock. The tongs are stuck in the ground as a substitute for the broken gnomon. John has the rake. House Rock is the very large boulder beyond John's right shoulder. Helmet Reflection of What ? 166:49:06 Rightward of 18602. View of House Rock from John's Station 11 pan. Smoky Mountain in the background. 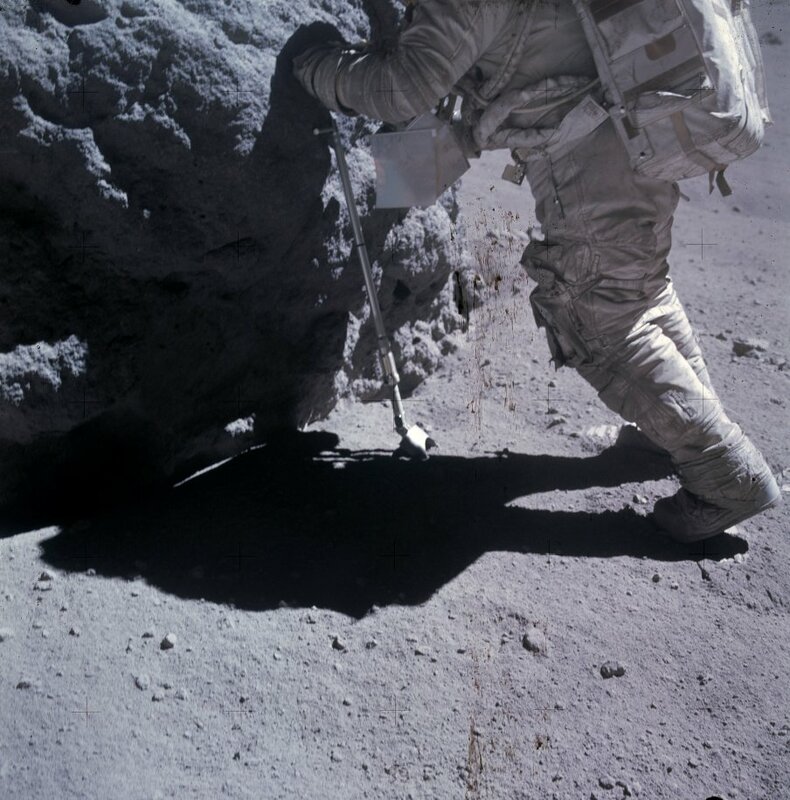 AS16-106-17340 (23 April 1972) --- Astronaut John W. Young, commander of the Apollo 16 lunar landing mission, is photographed collecting lunar samples near North Ray Crater during the third Apollo 16 extravehicular activity (EVA) at the Descartes landing site. 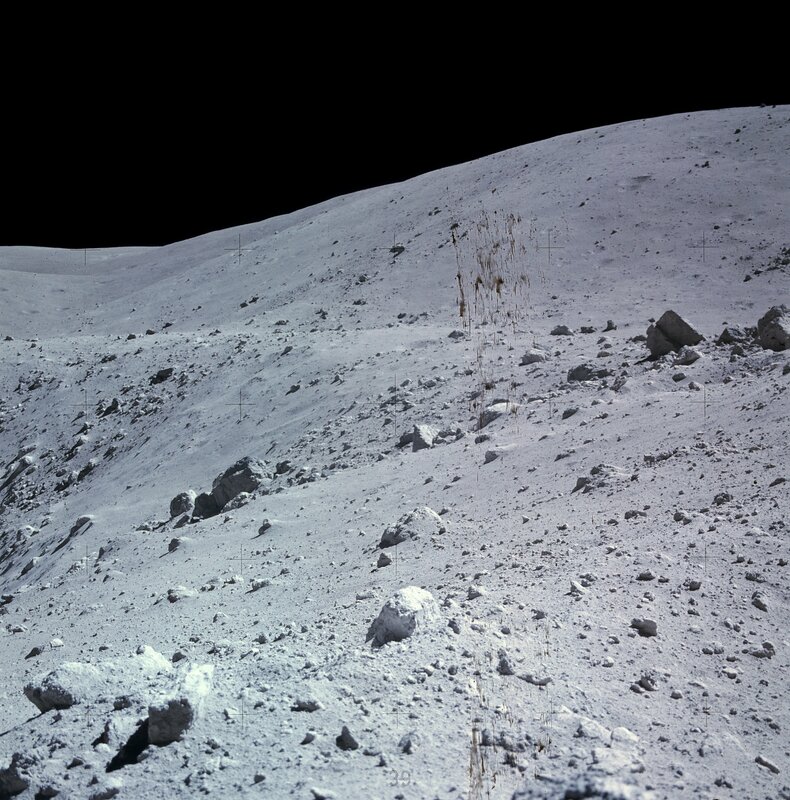 This picture was taken by astronaut Charles M. Duke Jr., lunar module pilot. 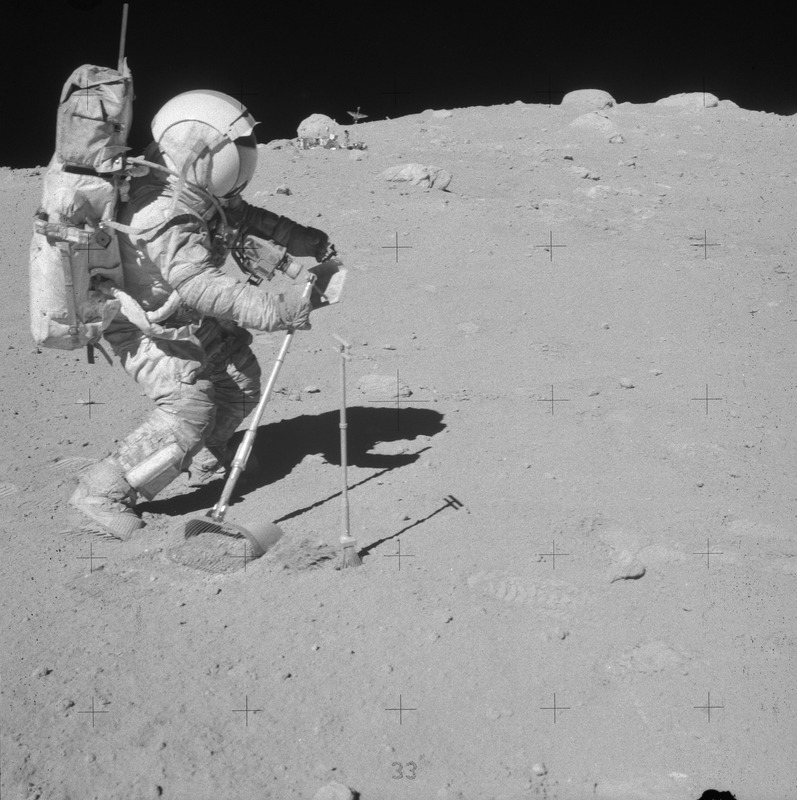 Young is using the lunar surface rake and a set of tongs. The Lunar Roving Vehicle (LRV) is parked in the field of large boulders in the background. While astronauts Young and Duke descended in the Lunar Module (LM) "Orion" to explore the moon, astronaut Thomas K. Mattingly II, command module pilot, remained with the Command and Service Modules (CSM) in lunar orbit. Link - How Young is Young? 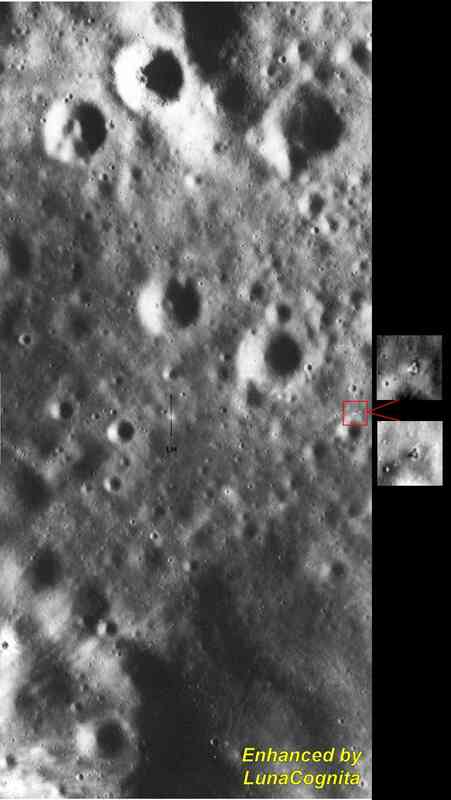 This portion of the frame shows the area around the LM. 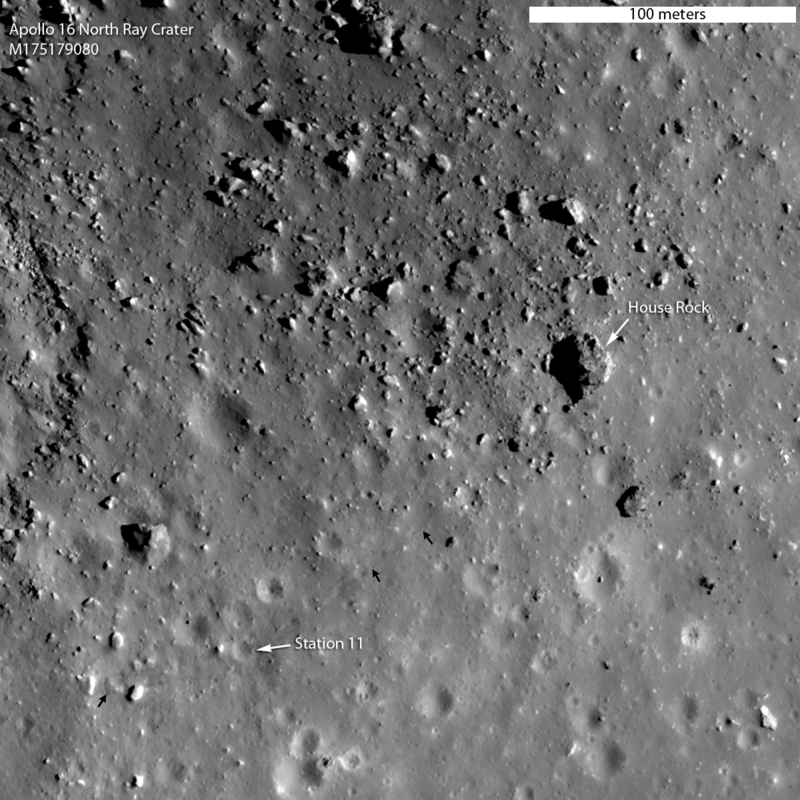 The large crater at top center is Palmetto. The LM is near the center of the image, at the center of a small bright patch. 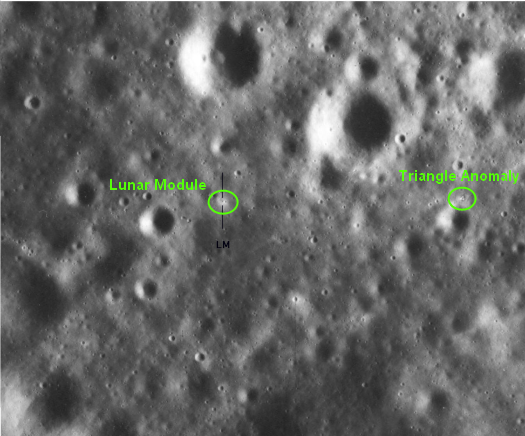 A detail shows the LM and the craters along the EVA-1 traverse. 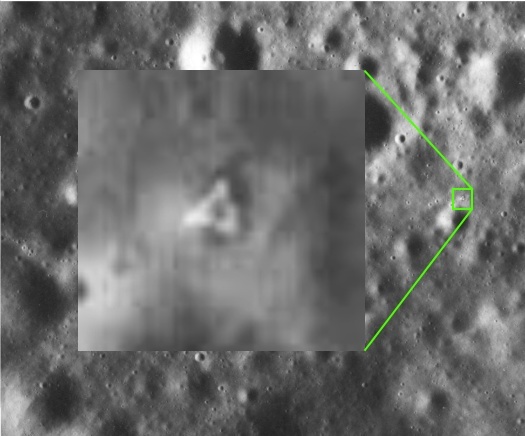 The LM can be seen just above center near the right edge of the picture. North is up and the LM is in the bright area created by the engine exhaust on the west side of a small crater. 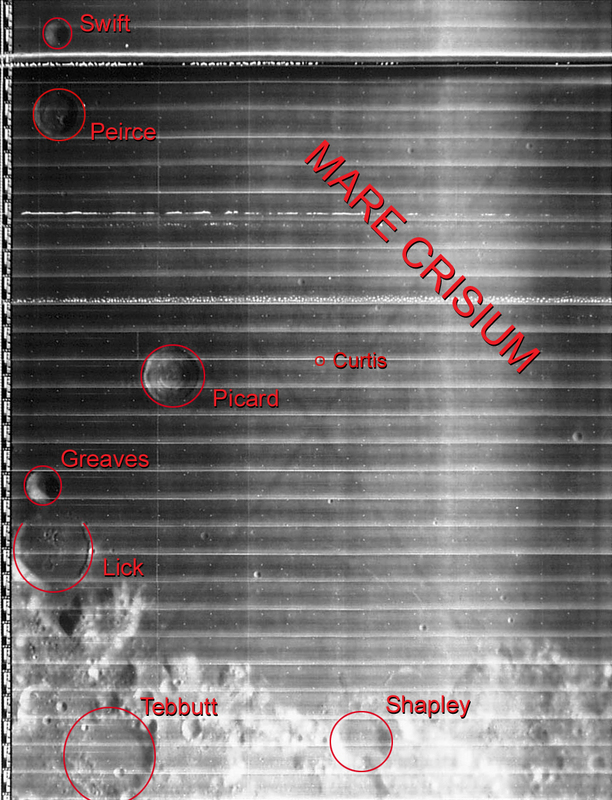 A detail identifies the named craters which are mentioned during the EVA-1 traverse. 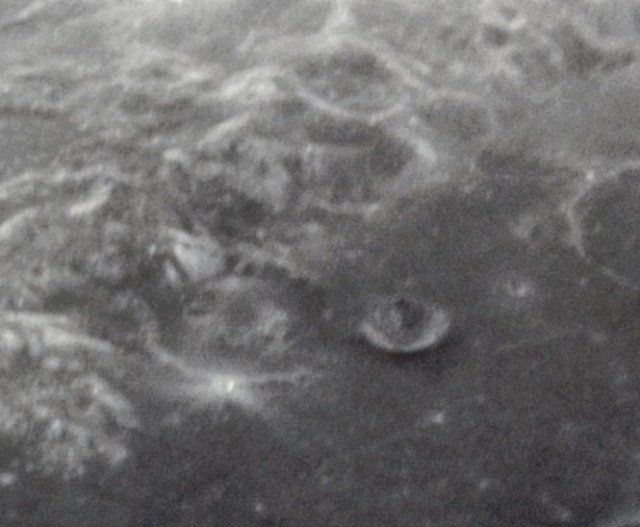 AS16-121-19438 (April 1972) --- An oblique view of a portion of the lunar nearside as photographed from the Apollo 16 spacecraft in lunar orbit, looking across the Sea of Crises southwesterly into the Sea of Tranquility. The conspicuous, bright-rayed crater is Proclus. 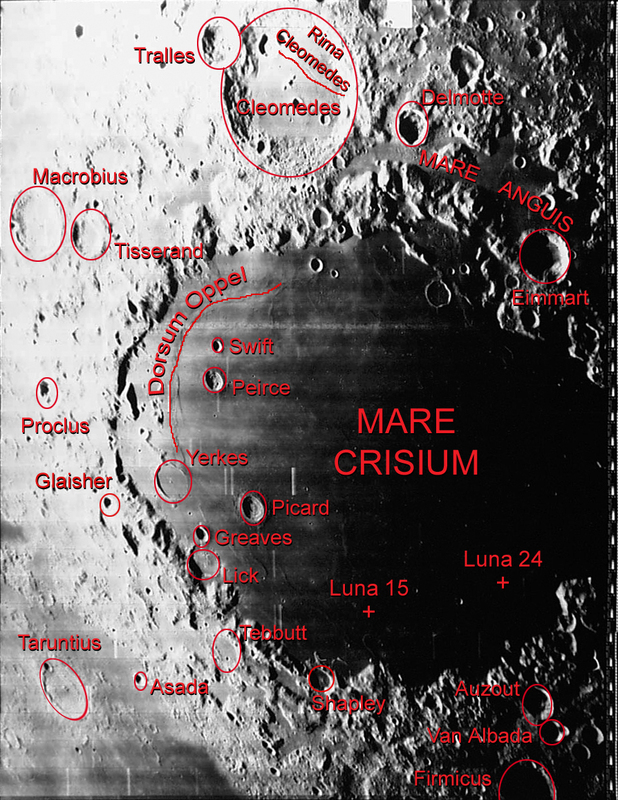 The crater Taruntius in the northeasterly portion of the Sea of Fertility is near the left center edge. A portion of the Sea of Serenity is visible on the horizon at upper right. Amazing! ... this thread has 2098 views and No replies from anyone ! easynow wrote: Amazing! ... this thread has 2098 views and No replies from anyone ! I don't have the link or the video so I can't prove it to you right now but I'm just saying - I have a suspicion that some of these objects may not be rocks and there probably exists GCTA and/or DAC footage of House Rock that may be interesting to look at as well in this thread. Hey I just found that video I mentioned! 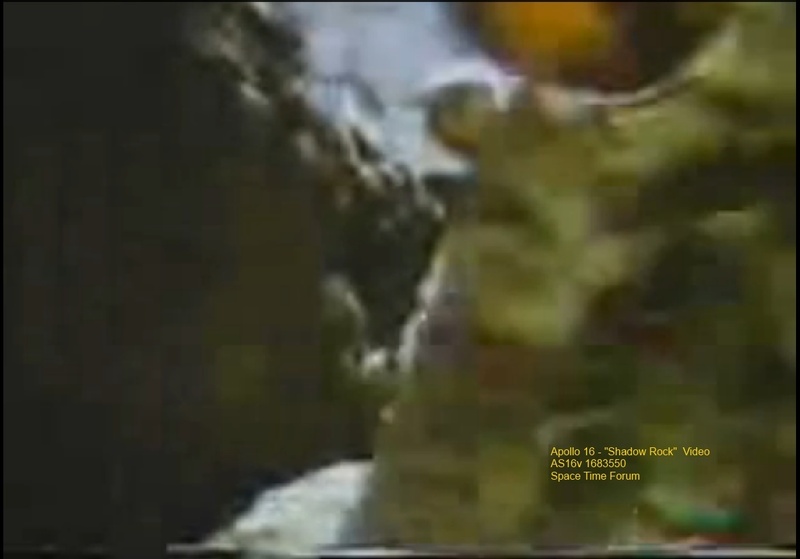 The TV anomaly occurs when the astronauts are visiting "Shadow Rock", but this clip involves "House Rock" as well so I remembered correctly. What we need is better quality GCTA TV footage, but that's hard to come by on the internet it seems. I wonder why eh? You're doing a great job easynow and the House Rock anomalies look very strange and interesting! And yes, these images are interesting so that's why I was surprised to see this thread being ignored. Agreed ... and thanks for posting the video link. Is that what the video you posted .... was trying to show us ? or did I miss it and it was something else ? Hi there easynow, thanks for the reply and you are very welcome. Yes that video is a strange one isn't it?! This topic about the "House Rock" anomalies reminded me of seeing this video and learning about LunaCognita's work on the quindar tones and the DRR system. I couldn't actually remember what it was or if the video even showed anything substantial, and I never actually looked for it again until this topic reminded me of it. I'm glad I found it again and I think you are exactly right - the video is drawing attention to that strange bright light effect you can see on the "rock" in the background there. Again that is spot on my friend! This strange brightness effect is occurring when one of the astronauts is really close to the GCTA-TV camera and his body is moving through the field of view. The astronauts' body moving through the FOV very rapidly covers - and then uncovers - the background scenery, and that's what makes this brightness anomaly so interesting. I know you are familiar with this easynow, but for our readers I would like to say - if you haven't read the topic on the quindar tones and the DRR system, make sure to check that out and go through it. I have done a lot of research on this, particularly on the quindar tones, and I have proven this to myself: as incredible as it may sound, the DRR system is real, and it was really used. 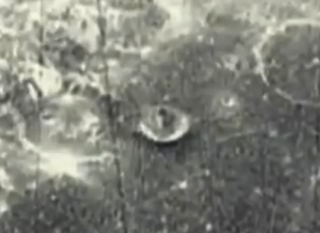 DRR stands for Discrete Recognition or Rejection - so what does that say about what we see in the Apollo televion footage? Hypothetically speaking it could be possible that only the Hasselblad photographs are compromised with fake backgrounds, and that we are seeing the real mountains and rocks and lunar background scenes on television. But - if everything we are seeing in the Apollo lunar surface GCTA-TV broadcasts - is real - well then NASA wouldn't need a DRR system now would they?! So far I haven't seen anything fully convincing in terms of anomalous television frames but I am working on it and I'm telling you easynow - I bet that those TV transmissions are compromised as well. The existence and purpose of the DRR system proves that much. 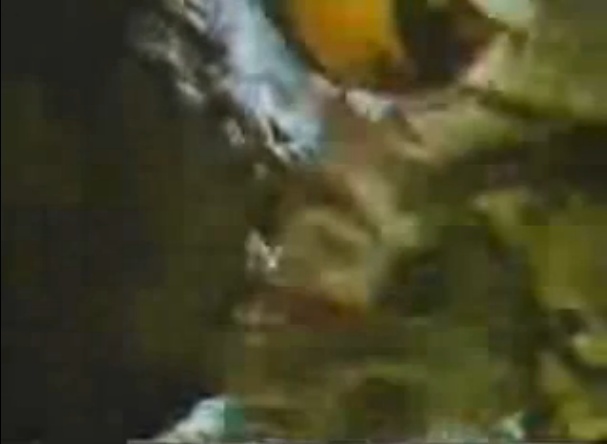 The fact that this brightness anomaly in the video occurs when the astronaut briefly blocks the view with his body, is interesting I think. 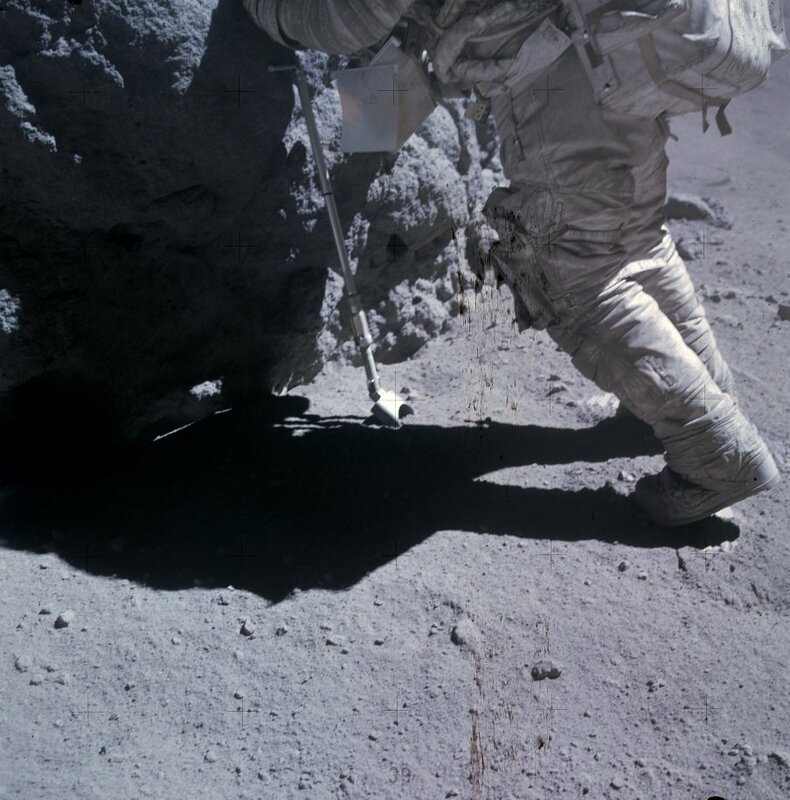 I am theorizing but you could say that when the astronauts' body rapidly blocks and then unblocks the - manipulated - "Shadow Rock" background scene, this very fast "scene processing" could present a serious challenge to the DRR's processing capabilities. I can imagine a kind of glitch or error that slipped through because the DRR couldn't keep up with the processing, or something like that. How does that sound to you? I can't be sure and I would like to take a good look at this scene in very high resolution and subject it to a frame-by-frame analysis. 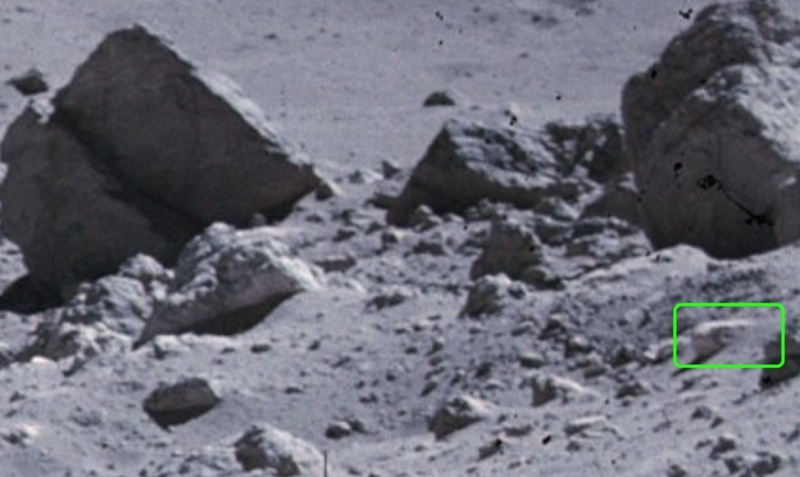 Looking at all the strange objects in the photographs you posted here easynow, it's no accident that this strange brightness anomaly occurs in the "Shadow Rock" scene. NASA was literally covering over a lot of stuff on those photographs and television pictures, and it makes you wonder what they really found up there doesn't it. The brightness effect you mentioned was puzzling me at first (see above) but now that I've taken a break and looked at this video again, I think I know what is happening. It's not just the "rock" that gets brighter when John Young crosses the camera's FOV - the entire scene gets brighter. I think what we are seeing at that moment is actually an example of the GCTA TV system's automatic brightness/contrast adjustment system. 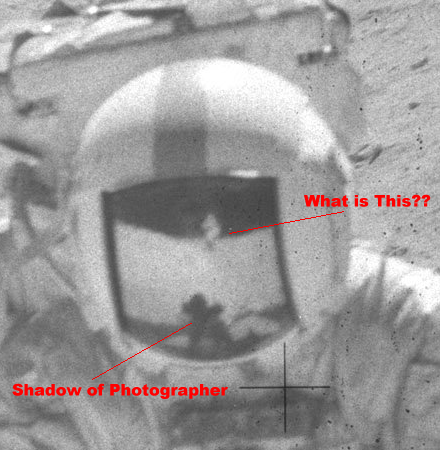 Because the astronaut crosses the FOV very close to the camera, the entire scene goes "dark" and the TV system is trying to compensate for this by increasing the brightness, so that is why we see that portion of Shadow Rock "light up" as it were. It also occurs to me now that, when John Young is past the camera and no longer blocking the view - the scene momentarily becomes very bright because the TV system needs a few moments to "switch back" and turn the brightness down again. As this happens, you see the camera panning to the right very quickly - presumably to prevent us from seeing too much of Shadow Rock when the brightness is high enough to spot details like the ones pointed out in the frame grab above. It's all very suspicious isn't it; I can't wait to get my hands on some better quality images. Thanks for watching the video and they do go on to say the flashes were never explained. You have to wonder though, If they weren't meteor impacts, then what is the explanation ?? "I like the part .... when the astronaut passes though the FOV .... and the rock somehow gets brighter ! ...."
The brightness effect you mentioned was puzzling me at first (see above) but now that I've taken a break and looked at this video again, I think I know what is happening. It's not just the "rock" that gets brighter when John Young crosses the camera's FOV - the entire scene gets brighter. I think what we are seeing at that moment is actually an example of the GCTA TV system's automatic brightness/contrast adjustment system. Because the astronaut crosses the FOV very close to the camera, the entire scene goes "dark" and the TV system is trying to compensate for this by increasing the brightness, so that is why we see that portion of Shadow Rock "light up" as it were. It also occurs to me now that, when John Young is past the camera and no longer blocking the view - the scene momentarily becomes very bright because the TV system needs a few moments to "switch back" and turn the brightness down again. Good work Max, that makes sense and you might be correct but do we know for a fact the camera had an automatic adjustment ? Just wondering because I'm not sure. As this happens, you see the camera panning to the right very quickly - presumably to prevent us from seeing too much of Shadow Rock when the brightness is high enough to spot details like the ones pointed out in the frame grab above. It's all very suspicious isn't it; I can't wait to get my hands on some better quality images. The camera pan may just be reactions from the object recognition system ? 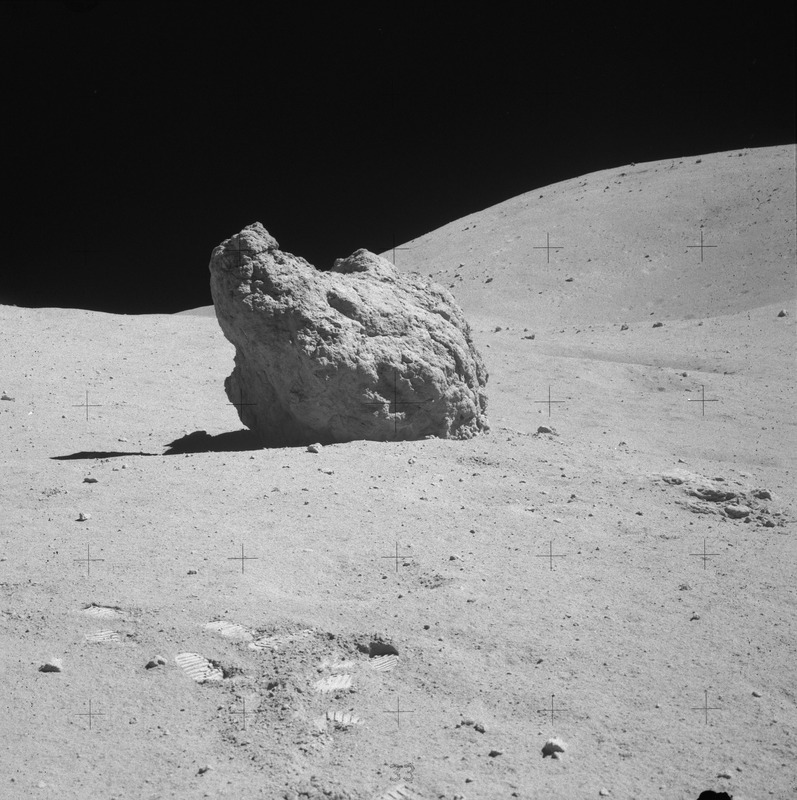 AS16-116-18670 - 168:36:09 Charlie ran out of film before he could get a soil sample from under Shadow Rock. Charlie is leaning on the rock as he gets the sample. 168:36:09 Duke: Oh, that's okay. Look at this! 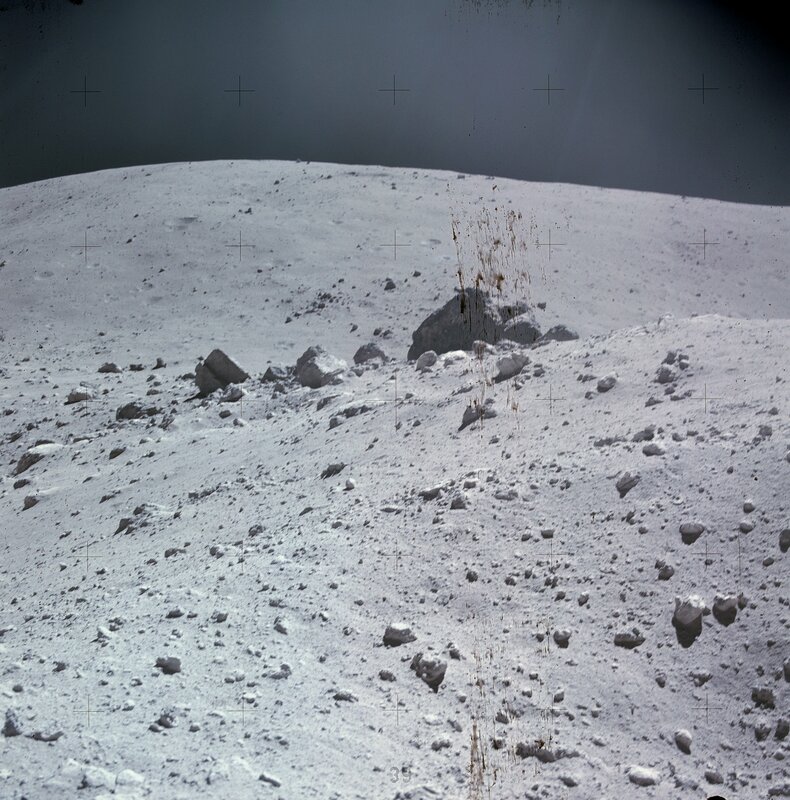 During Charlie's next transmission, John takes a cross-Sun stereopair from the south that shows Charlie and the rock face he is examining. These pictures are AS16-116- 18670 and 18671. 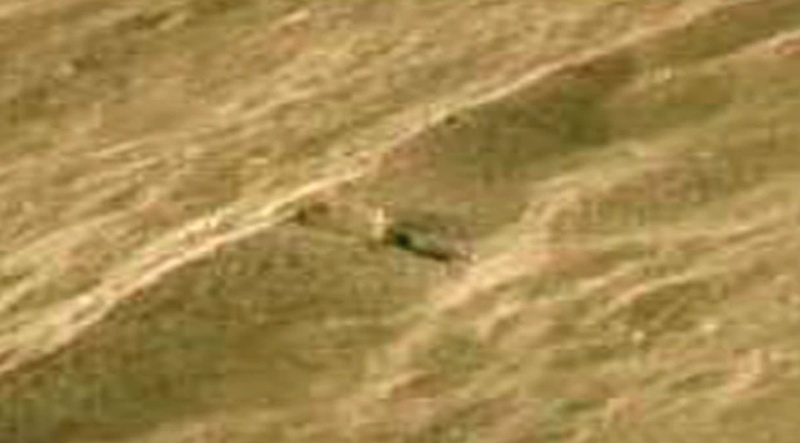 John then runs back to the Rover and goes off-camera to the left. Just for visual purposes, here's the video frame without the markings. @ 0.39 mark ... Why do I hear CAPCOM say something about grabbing the rock handles ?? Do you hear that too ? And ... if a rock has handles is it a rock ? Frames 17392 and 17393 show Shadow Rock with Smoky Mountain in the background. ...do we know for a fact the camera had an automatic adjustment ? Just wondering because I'm not sure. Yes we do. The Apollo GCTA TV camera had an integrated system called ALC - Automatic Light Control. Ground-Commanded Television Assembly (GCTA) Operations and Checkout Manual (rev. Jan-1972). Automatic Light Control (ALC) - A 3-position switch (PEAK, REMOTE, and AVERAGE) at the rear end of the camera controls ALC operation for peak or average scene luminance. The REMOTE position permits ground control of the ALC function, and selection of operation on peak or average luminance. The switch is spring-loaded and returns to the center (REMOTE) position when not being actuated. ALC PEAK and ALC AVERAGE commands operate a latching relay in the CTV [Color Television Camera] to control operation of the ALC and AGC [Automatic Gain Control] circuits. In ALC PEAK, detectors in the ALC/AGC circuits are set to provide 100 percent video level for the brightest object in the scene. This mode is used for viewing astronauts, the LM, LRV, Earth, and to pan the horizon. ALC AVERAGE switches the ALC/AGC detectors to provide a 60 percent video level for the averaged scene. 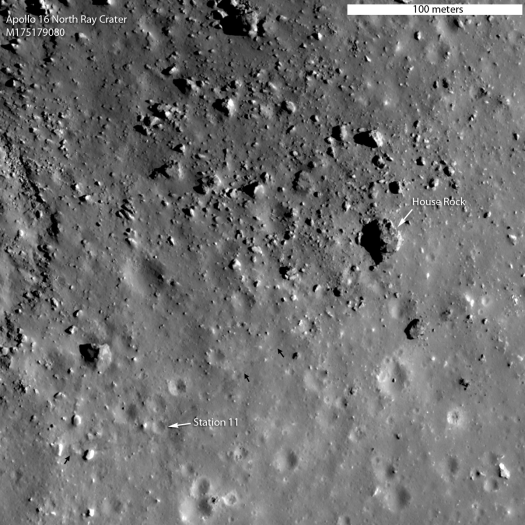 The AVERAGE mode is used for viewing the lunar terrain and to provide visibility into shadow areas. During camera operation, the ALC is constantly working to optimize the output picture by making small adjustments to the brightness, and whenever there is a major change in the scene being filmed, you can clearly see the ALC at work. 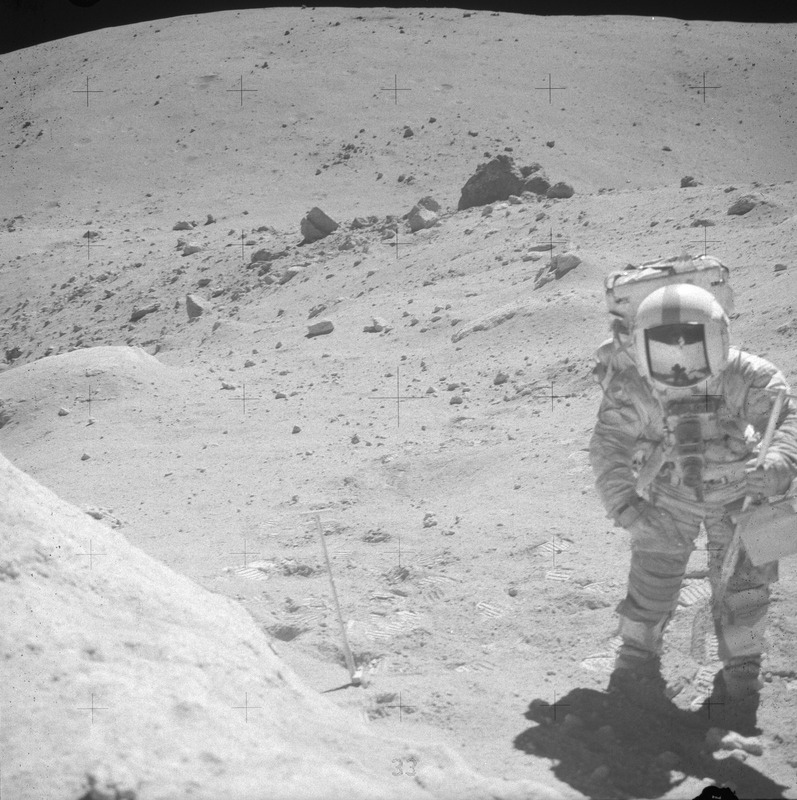 For example when the scene is shifted suddenly or when bright objects (like astronauts) enter and exit the field of view, the adjustments in brightness are quite noticeable - like the example I mentioned where John Young crosses the FOV very close to the camera. Eeerm... how ? You mean like the camera pans away on its own because of what is happening in the scene ? That would be cool but I don't think the DRR system could do that. The camera was controlled remotely from Earth so I think it's just Ed Fendell moving the camera. I think he says "samples" or at least that's what I'm hearing, it's difficult to make out. Maybe you're hearing what you want to hear because in the TV stills it really looks like the rock has "handles"... that area looks really weird. The Hasselblad image you posted is pretty close in terms of perspective I think - looking at the shadow it is more or less the same angle, not the same but it should be close enough to do a comparison. I don't see anything special in the photograph, but do the details of that boulder look the same to you as they do in the TV footage ? 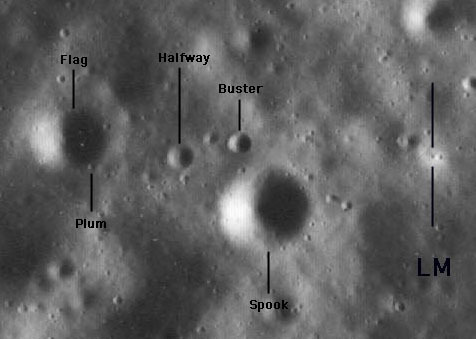 Max Peck wrote: I don't think anybody really knows and what amazes me is that lights and flashes on the Moon are reportedly also seen from down here on Earth. The Moon is crawling with Aliens and could be the explanation, but imo it's also possible it has something to do with Transient Lunar Phenomena. Nice work and thank you for posting that information ! Eeerm... how ? You mean like the camera pans away on its own because of what is happening in the scene ? Yes and I have no proof of course, but I firmly believe that's a definite possibility. And of course at that precise moment, the camera just happens to run out of film ! I think he says "samples" or at least that's what I'm hearing, it's difficult to make out. Maybe you're hearing what you want to hear because in the TV stills it really looks like the rock has "handles"... that area looks really weird. 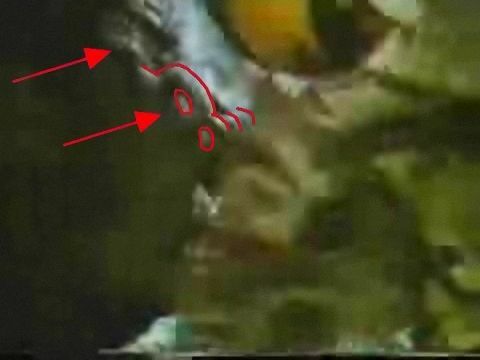 Maybe and no the details seen in the video verses the still images definitely don't match.